Tired of picking up pet waste in your RV park or campground? Provide dog owners the means to pick up after their dogs with our Dogipot® pet waste stations. These dog waste stations provide pet owners dog poop bags to pick up waste and a trash can to dispose of the pet waste. What could be easier for dog owners? A sign reminds dog owners of their duty to pick up after their pets. 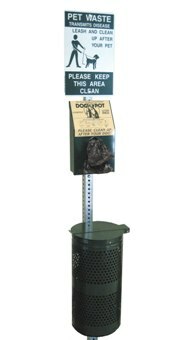 Go to top of this Dogipot Pet Waste Station/Steel Receptacle 1003-L page.